Kevin Bubriski has been photographing Nepal for forty years since first arriving here as a Peace Corps volunteer in 1975. Kevin returned to Nepal in 2015 to document the earthquake’s devastation and recovery efforts in the Kathmandu Valley, Sindupalchok and Dolakha, and again in the 2016-2017 academic year for a Senior Scholar Fulbright Fellowship. 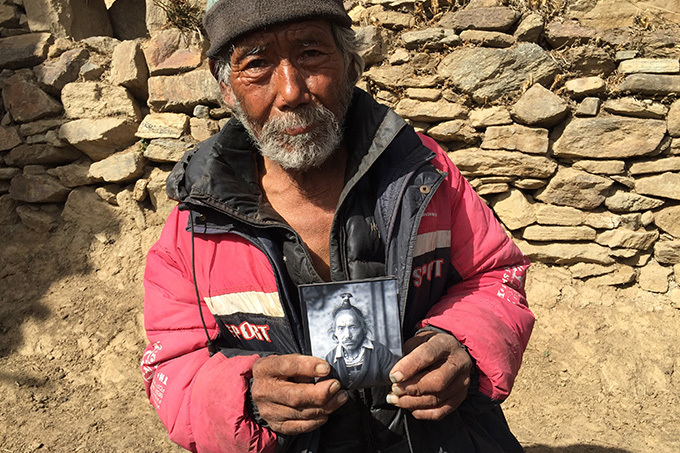 Kevin will show a selection of his work from the 70s and 80s as well as his recent work (2016-2017) from the Karnali Zone and Humla District in north west Nepal from where he recently returned. His photographs present the impact of new motor roads in places that were always roadless. Kevin’s photographs are in the permanent collections of the Museum of Modern Art, Metropolitan Museum of Art, San Francisco Museum of Modern Art, and Bibliotheque Nationale, Paris. Kevin is recipient of Guggenheim, Fulbright, NEA and Robert Gardner fellowships. His books include “Portrait of Nepal” (1993) and “Power Places of Kathmandu: Hindu and Buddhist Holy Sites in the Sacred Valley of Nepal” (1995), “Maobadi” (2011), a collection of portraits of Nepal’s Maoist combatants and “Nepal 1975-2011” (2014). His recent book “Look into My Eyes: Nuevomexicanos Por Vida 81-83” was published in March 2016 with the Museum of New Mexico Press. Kevin is an Associate Professor of Photography and Documentary Studies at Green Mountain College in Poultney, Vermont. ​This is a public lecture and admission is free of charge and open to all. Seating will be on a first-come-first-served basis. ​Kindly park your vehicle on the lot opposite Roadhouse Restaurant, Jhamsikhel.